A researcher is asking residents of France to be alert to a worm originating from Brazil which is threatening the biodiversity of the country, especially in the Dordogne (Nouvelle-Aquitaine). 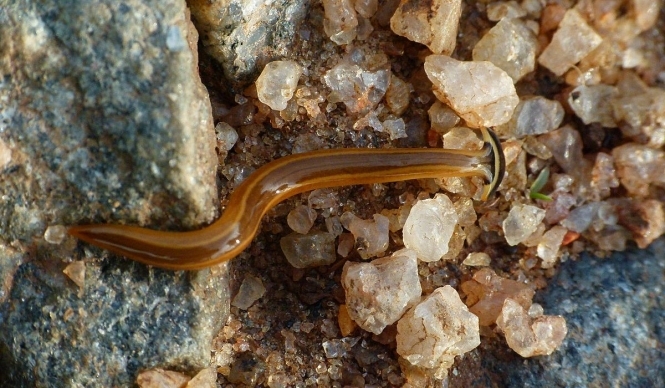 The worm, whose proper name is Obama Nungara - no connection to the former President of the United States - can measure between five and 10 centimetres in length. It is also known as the “plathelminthe” or the “flatworm”. Flat, brown, and shiny in appearance, it has thousands of of tiny eyes along the edge of its body, and a mouth in its “stomach” area. It is thought to have arrived in Europe five years ago, hidden among imported plant pots, and was only identified and named officially by Brazilian researchers in 2013, after its arrival here. The problem is that the worm is not native to Europe. It feeds off normal European garden worms, which are essential to the health of our soil, and has no known predators. Mr Justine has now set up a website on which members of the public can report sightings of the worm in their own garden or surroundings. Once you are certain that the worm you have seen is an Obama, you can fill in a form and send your observation notes and good quality photos to the MNHN online (in French). You can also send your own email to justine@mnhn.fr, sending close-up photos of the worm, and indicating the address and region of the sighting. The only way to remove the worm is to kill it manually, either by destroying it one-by-one, or by burning. Anyone wishing to pick up or store the worm for observation should do so using gloves; keep it in a closed box lined with damp kitchen paper; and store it in a cool place. You may also contact Mr Justine to ask his advice on what to do. The worm has now spread through 60 departments in France, as well as the UK, Spain, Switzerland and Italy. It has been spotted twice in the Dordogne recently. No study has yet been done on the impact that it could have on the wider biodiversity of European soil, although researchers have concluded that such a study is necessary. The issue is similar to that of the Asian hornet - another invasive species that came to Europe and has caused problems by eating our native bees.